Textbooks are one of the primary resources of instruction for most courses at the university level. They can act as a framework or backbone to the topics addressed in the course by providing explanations, examples, and practice problems to students. An ideal textbook should be well organized and clearly written, at a level that does not confuse or frustrate students with unnecessary jargon, idioms or colloquialisms. In the sciences, and many other fields, there are three or four large publishing companies which dominate the textbook market. They offer professional quality books for almost every university science course offered, written by talented authors. These texts are scrutinized by a team of editors and reviewers and consistently updated with new editions. 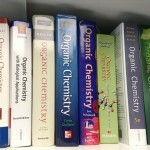 For the courses that I currently teach, Organic Chemistry I and II, there are over a dozen good quality textbooks that I could have used, each with minor pros and cons. Unfortunately, these textbooks all share one very negative thing in common, a price tag between 125-200 dollars. The high price of current edition textbooks can be a large burden on our financially strapped students. A student with a full course-load of five classes per semester, could conceivably pay up to 2000$ per year on textbooks! At British Columbia’s current minimum wage of 10.25$/hour, this would take nearly 195 hours of work to pay for. Many instructors, school districts and universities are now examining the use of Open Textbooks, open-copyright freely available resources, which would cut costs to simply the printing and binding of the books (25-50$ each). BCcampus has been tasked with co-ordinating a project to create or adapt existing open textbooks for the 40 highest enrolled first and second year courses at public post-secondary institutions (http://open.bccampus.ca/about-2/). 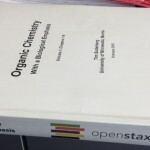 In the summer of 2013, I was selected to review an existing Organic Chemistry open textbook: Organic Chemistry With a Biological Emphasis Volume 1 (http://open.bccampus.ca/find-open-textbooks/?uuid=f01f98b4-925d-4e94-bc82-c1d707e6280e&contributor=&keyword=&subject=Chemistry). For a couple of weeks during the summer, I would take a hard copy of the textbook (provided by BCcampus) with me to the neighbourhood coffee shop to read. I found the text to be written in a clear, understandable voice, but definitely lacked the ‘polish’ or refinement of the professional (for profit) textbooks. While the core of the text was generally good, many little things were lacking like figure numbers, figure quality, typos, number of examples, number and quality of practice problems and lack of instructor resources. In other words, the author Dr. Timothy Soderberg did a great job conveying the majority of the material, but just did not have the resources to fine-tune the rest of the text like a major publishing company could. I have a feeling this is a common problem with open texts, and until there is sufficient funding and time invested to remedy this; many instructors may keep assigning the professional (for profit) textbooks. Personally, I have not switched to the open textbook. 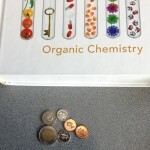 Many students find Organic Chemistry I and II are some of the most challenging courses they take, and I believe I should assign and provide only the most clear, and understandable resources that give them the best chances of success. For the moment, that means I will continue to assign our 150$ textbook which covers both courses.